Rainbow Falls may be just one of dozens of five-star waterfalls gushing through the steep canyons of the Jocassee Gorges, but this one doesn’t require an all-day hike. The short trek will give hikers a taste of the remoteness and sensational topography of the Blue Ridge escarpment—the wall of mountains that separates the high country from the Piedmont. The 7,500-acre Gorges State Park, established in 1999, protects one of the most remarkable regions of the state and portions of the seven headwaters that burst through sheer terrain to form Lake Jocassee. Begin the hike just beyond the park’s new visitor center at Grassy Ridge parking area. Roughly a quarter mile from the trailhead, turn right on the orange blaze trail and descend the wide gravel footpath. 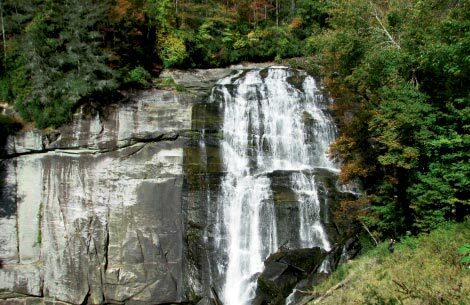 Eventually, the trail crosses into Nantahala National Forest and meets the Horsepasture River, where it turns upstream toward the roar of the falls. Around a bend, you’ll be greeted by the refreshing mist of the spectacular cascade plummeting over a cliff, which is bordered by steep forested ridges. Cool off at a viewing area near the base of the falls or follow the stairs to the source. Backtrack to complete the trip. Navigate: From Sapphire, follow N.C. 281 south for just less than a mile to Gorges State Park. Enter the park and bear right past the visitor center to the parking area.